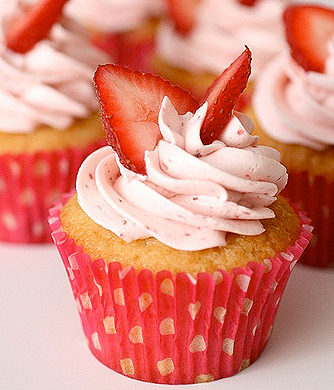 Sweeten up Father's Day for your dad by treating him to strawberry cupcake. You can easily prepare this sugary delight by using these stepwise food directions. 1) All-purpose flour - 1 3/4 c.
3) Sugar - 1 c.
4) Walnuts - 1/2 c, chopped. 5) Egg whites - 2 x. 6) Vanilla extract - 1/2 tsp. 7) Vegetable Oil - 1/2 c.
8) Fresh strawberries - 1 cup, crushed. 9) Granulated sugar - 3 tsp. 1) Mix fresh strawberries with granulated sugar. 2) Combine flour, baking soda, sugar and nuts together in a medium sized mixing bowl. 3) In another bowl, pour the egg whites, vanilla extract and oil. Whisk together to blend them well. 4) Add in the strawberries. 5) Drop the strawberries into the mixer tray and beat at slow speed until the berries are partially broken. 6) Add in flour mixture and whisk slowly until you get a smooth consistency with the berries still a little bit chunky. 7) Pour batter into greased muffin tins, filling each of them upto the middle. 8) Bake the batter at 350 F for about half-an-hour, or until done . 9) Remove cake from heat. Sprinkle powdered sugar over them or decorate with your favorite frosting. Serve immediately or refrigerate until required. Thinking of making something different on this Father’s Day? Well your worries can be answered as TheHolidaySpot provides you with perfect ideas to prepare special cakes for your beloved dad and satiate his taste buds. So continue reading and see if you can enchant your dad with some yummy special cakes especially prepared for your Daddy Dear! This can be adapted to suit your requirements for the cake and to delight your dad. 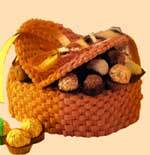 The cake base can be Madeira or a pound cake, or a rich fruit cake. The cake may be round, or an oval cake may be cut from a large square cake using an oval-shaped template. Cover a rich fruit cake with almond paste and coat* with sugar paste (rolled fondant), or royal decorator's white frosting first, before piping with royal icing. Use a butter-cream frosting for a light cake. And coat the top of the cake with certain butter cream first before piping on a basket weave pattern. 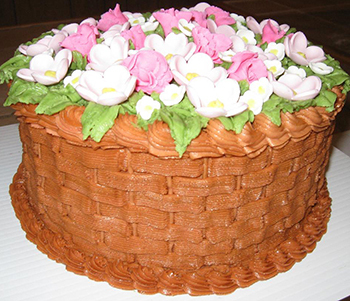 The basket weave piping technique is easy and is same for butter cream and royal icing. Roll out gum paste fairly thinly and cut out two pieces of the shape of half the cake top - they will form the lid. Leave to dry. The basket weave tube has a flat, jagged end. Pipe a plain vertical line through this jagged end. Then pipe short length of basket weave across the line. Then pipe another plain line along the ends of the basket weave strips. between the existing strips and over the new plain line. Continue building up the basket weave until the whole area is covered. with an appropriate powder food color. Then pipe a basket weave on top. pipe a line of basket weave along this central line. Now take up the dried paste lids. Pipe weave basket patterns on each of them. each lid half in an open position on the cake. Fill the area under each lid with chocolates and candies. If using decorators' white icing, the join between each open lid and the cake should be edged with piped shells, both on top and underneath. In this case you turn out a truly sumptuous presentation for your dad. *Before applying any coating to the cake, cut a template, the same size as the cake, then fold it in half and cut along the fold.